I’m an APLS instructor & course director and have contributed various bits and bobs over the years and it’s a great course. I’d go further and say that it’s a really great course to get a grounding in Paeds resus that has made a real impact to paediatric care around the world. I love it, the organisers, the content and pretty much everything about it…., well almost everything. If you’ve done the course in the last few years you’ve no doubt seen that the APLS formulas have changed for weight calculation. We’ve gone from a nice and easy to remember (Age+4) x2 to a rather more complicated set of three formulae that require quite a lot more thought, memory and calculation.Maybe I’m getting old, but I find it tricky to recall this immediately and I have to look it up, or surreptitiously glance at the wall in resus for a quick aide memoire. Is it me, or is just a bit more tricky these days. So, in the 5th edition APLS we have seen an increase in complexity, but does that lead to an increase in accuracy for us as emergency physicians? A couple of years ago I helped three of my trainees to look at this in the UK, and despite valiant efforts to get it published we have failed as we appear to have failed to get a message across about weight estimation in the resus room, but if you will permit us the vanity of self publication we’d like to share the findings here on the blog. This work is based on the fabulous efforts of Pete Hulme, Amar Javaid and Ken Anderson. [learn_more caption=”What did we measure?”]Working in a paediatric ED it’s quite easy to audit this sort of data so we measured the weights of 1000 children presenting to an inner city paediatric emergency department and then calculated the estimated weight according to the old and new APLS formulae (based on their recorded date of birth). We then went on to formally weigh all children on scales in the paeds ED as a gold standard weight. [/learn_more][learn_more caption=”What about the analysis?”]This is where we ran into a spot of bother with reviewers and journals. 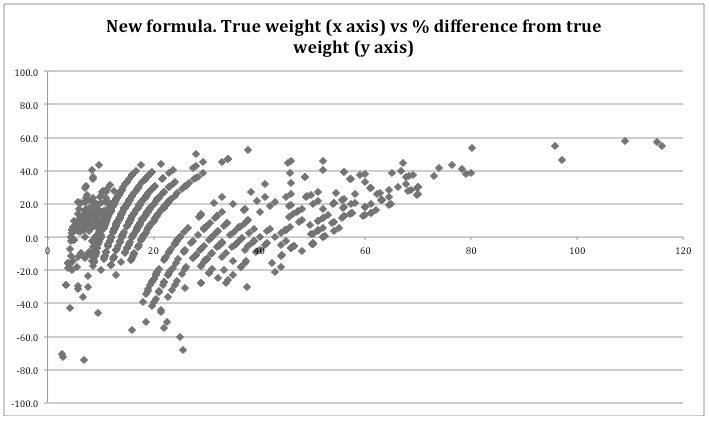 Many previous papers and many reviewers were keen to look at the overall accuracy of one score against another, that has typically been achieved by looking at the average weight as predicted by the formula vs the real weight. You can compare the performance of one score against the other by looking at how well the correlate overall. Correlation is one way of looking at agreement, but for many reasons it’s a bad way when looking at this sort of data. You usually get a good correlation simply because as true weight goes up, then so does the estimate (obviously). It’s not helpful and does not tell us as clinicians what is important. Correlation is too easy, too lazy and too likely to give a nice positive result. As clinicians we don’t need simple correlation we want to know if there is a clinically important difference between an estimated weight and the real weight. So, what is a clinically important difference? Let’s say that you estimate a weight and it’s 5% different from the real weight. Would that be important clinically? Probably not, but what if it were 10%, 15% 20% or more. Arguably as the % difference between measured and actual weight increases the greater the clinical significance. In our opinion (and it is only an opinion) we felt that over 15% and certainly over 20% different could be important when considering resus drug doses and fluid requirements for paediatric resuscitation. That’s just our opinion, please feel free to disagree. So that’s how we looked at the data. We looked to see how often the estimated weight differs from the true weight as a percentage difference from the true weight. We compared the two weights by plotting the actual weight against the percentage discrepancy between measured and calculated weights. We then calculated the discrepancy in weight estimations using cut offs at 10,15 and 20% body weight discrepancy with 95% confidence intervals assuming a normal distribution. Firstly, let’s have a look at the data as distributions. I like looking at distributions as you can get a feel for what the data is before applying summative statistical tests. It’s something I learned a long time ago and it’s advocated by Bland and Altman, gurus of the med stats world. Anyway, at first look the new formula appears to be a better fit for the true weight of paediatric patients, but what about the number of patients who fall outside of the clinically important difference? We can tabulate this looking at the numbers of patients who fall outside the 10,15 and 20% ranges across the three age groups linked to the new formula. The table supports our first assumption. The new formulas are indeed more accurate. [/learn_more][learn_more caption=”But what does this mean for me as a clinician?”] Well, you might want to stop right now and say ‘fine’ the new formulae are more accurate and therefore that’s what I’m going to use. If so then fab, crack on with your calculations. However, you might want to stop and think about what this data really tells us. In our opinion it tells us that even though the new calculations are more accurate, they would better be descried as ‘slightly less hopelessly inaccurate’. For example, at worst case scenario the new formula is discordant to the true weight by >20% nearly 3 in 10 patients and that is surely not accurate enough for the resus room. 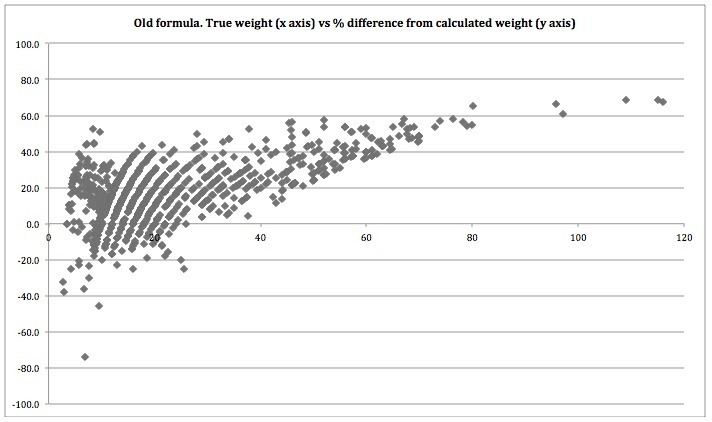 The message here is that formulas do not predict weight. [/learn_more][learn_more caption=”Hang on a minute…..”] Ok, ok, there are a bunch of criticisms you can throw at us, there will be more but let me start you off..
You are presuming that this matters. You’re clinically important difference may not be important at all! This was all patients I only want to know about resus patients (it was the same sort of variability, but small numbers)[/learn_more][learn_more caption=”So what ‘are’ you trying to say here?”] It’s clear to us that the solution is to weigh the patient in all but the most exceptional circumstances (cardiac arrest and major trauma). How do we do this? Very simply, put a set of kitchen scales at the side of the bed as the patient arrives. If they are small enough to be carried in (common for kids coming into resus) the carrier stands on the scales as they approach the bed holding the child. We weigh the staff member plus child, then the staff member, do the maths and hey presto – a pretty accurate weight in almost all circumstances. We don’t want to come across as anti APLS here, not at all. APLS has taken an approach that we agree with. Estimated weights are essential in rare circumstances and the new calculations are slightly better than the old ones. Fair enough, we like that. 1. Krieser D, Nguyen K, Kerr D, Jolley D, Clooney M, Kelly A-M. Parental weight estimation of their child’s weight is more accurate than other weight estimation methods for determining children’s weight in an emergency department? EMJ. 2007;24:756-9. 2. Argall J, Wright N, Mackway-Jones K, Jackson R. A comparison of two commonly used methods of weight estimation. Archives of diseases in Childhood. 2003;88:789-90. 3. Luscombe M, Owens B, Burke D. Weight estimation in paediatrics: a comparison of the APLS formula and the formula ‘Weight=3(age)+7’. EMJ. 2010. 4. Luten R, Zaritsky. The sophistication of simplicity…optimizing emergency dosing. Acad Emerg Med. 2008;15:461-4. 5. ALSG. Advanced Paediatric Life Support: The practical approach. 4th ed. London: Blackwell Publishing. Agree entirely with your findings and recommendations. I also Course direct for ALSG PHPLS course, problem for the pre-hosptial practitioners nd AHP’s is they need one formulae thats quick and easy to use and not possible to weigh each child. More publications on the use of paeds weight estimation from colleagues in Hong Kong. And again here from the ADC which demonstrates that docs cannot remember multiple calculations. I too find it difficult to remember 3 different ones. Hmmmm…so what’s the way forward? I wonder if a NONOGRAM is going to be the way…or maybe a sort of dose vs centile chart? Any idea on current thinking Simon? Why does accuarcy of weight matter when doses are rounded up…15mg/kg…0.1mg/kg…I mean who comes up with these numbers? So think about it – most of the time doses are a made up round number that is reasonable – and we shouldn’t stress about the weight too much either. The old APLS formula was great – I use counting on my fingers 10,12,14 kg for age 1,2,3 years etc…even simpler than multiplying anything.